MUNICH — Framed by an andante Kyrie and a beguiling instrumental Communion marked grave, Cherubini’s 1825 Coronation Mass for Charles X is one handsome piece of music. No, its movements are not exactly symphonic. They sound bonded to the flow of the service, so much so that unset sections can be imagined. Words are crystal clear, floating on lucid melodic ideas that never overstay. There is no congestion of texture, instrumental or vocal. The chorus, in three parts (STB), references the Trinity but no doubt also hedged against the Reims cathedral acoustics; in place of vocal soloists, choral exchanges offer contrast and illumination. In short, this Messe solennelle is a world apart from its Germanic peers. 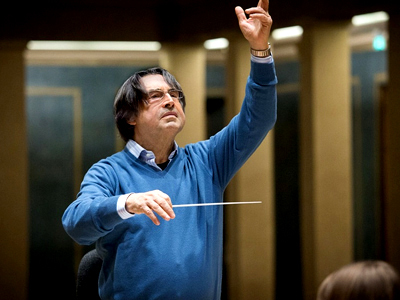 Revisiting the score 31 years after his Abbey Road document, Riccardo Muti appeared elated to perform it live in the Herkulessaal Dec. 17 and 18 with musicians familiar with Cherubini: the BR Chor, Latin-trained by Stellario Fagone of Bavarian State Opera and singing with poise and focus (also good diction: patch-em for once, not pats-em); and the Symphonie-Orchester des Bayerischen Rundfunks, enhanced by someone resembling the opera company’s imaginative solo clarinet, Andreas Schablas, all alert to the transparency of this Mass. (Of the seven Cherubini services championed by Muti and recorded* between 1973 and 2006 for EMI, four made their way to disc via London studios, three via live Munich concerts.) Unerringly Muti found the equilibrium and peace in the 56-minute work, an advertisement for restored royal power. His eloquent phrasing supported its structure and stressed its lyricism, and dynamic shifts were unexaggerated. He drew expressive contributions from the woodwinds, much used; conveyed details candidly, such as through the halting but pale Crucifixus; presented the elegiac 10-minute Offertoire as the score’s heart, soaring on a five-note figure; and tautly unified the sequence from the brief, plain Sanctus, through a long-breathed Thomas Aquinas setting, O salutaris hostia, to the slightly acerbic Agnus Dei. Best of all, he conjured a palpable hushed walkabout of the just-crowned monarch in that concluding Communion, a coup de concert that caught the audience off-guard both evenings. Schubert’s C-Minor Symphony (1816) emerged in comparably grand form before intermission, note-complete, each movement infused with a distinct elegance; the BRSO may love Mariss Jansons but it plays magnificently for Muti. The visiting maestro, however, looked less agile than for previous concerts in this hall, his upper body stiff and filled out. His printed biography sprawled to three pages, two more than for anyone else, and ended with a Riccardo Muti Music notice. Whether these concerts lead to an RMM CD or one on BR Klassik to share the music beyond Munich, or none at all, remains to be seen. Muti’s many major engagements since 2006 have produced little on disc. This entry was posted on Thursday, January 14th, 2016 at 7:14 pm	and is filed under Munich Times. You can follow any responses to this entry through the RSS 2.0 feed. Both comments and pings are currently closed.